Set on the beautiful Paseo de la Reforma, this upscale hotel sits in the heart of the Mexican Capital, just moments away from world famous museums, historical Zocalo, Zona Rosa’s nightlife and 18th century palaces. The 160 suites offer a welcome retreat, with plush amenities and and breathtaking views of Paseo de la Reforma and the city's skyline. 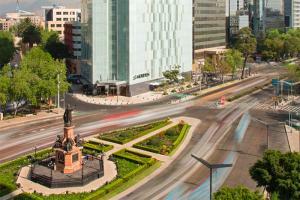 This hotel sits on the renowned Paseo de la Reforma at the intersection of the capital city’s eastern and western halves.